Otis Gold Corp. ("Otis" or the "Company") is focused on the discovery, exploration and development of precious metals deposits in Idaho. Otis’s management and technical team has a proven track record of discovering and developing quality assets and unlocking shareholder wealth through the drill bit and M&amp;A activities. Although the U.S. dollar is one of the world's most important reserve currencies, when the value of the dollar falls against other currencies as it did between 1998 and 2008, this often prompts people to flock to the security of gold, which raises gold prices . Deflation, a period in which prices decrease, business activity slows and the economy is burdened by excessive debt, has not been seen globally since the Great Depression of the 1930s. During that time, the relative purchasing power of gold soared while other prices dropped sharply. Demand for gold has also grown among investors. Many are beginning to see commodities, particularly gold, as an investment class into which funds should be allocated. In fact, SPDR Gold Trust, became one of the largest ETFs in the U.S., as well as one of the world's largest holders of gold bullion in 2008, only four years after its inception. The Kilgore Project lies on the north-eastern margin of the Miocene-Pliocene Kilgore Caldera complex in the Eastern Snake River Plain, Idaho. The Kilgore Project contains the Kilgore Deposit with a current NI 43-101 (completed in 2018) Indicated Resource of 825,000 ounces (oz.) Au in 44.6 million tonnes at a grade of 0.58 g/t Au and an Inferred Resource of 136,000 oz. Au in 9.4 million tonnes at a grade of 0.45 g/t Au (the “Deposit”). The Kilgore Deposit is a low-sulphidation, gold bearing, quartz-adularia epithermal system hosted in Tertiary volcanic rocks, local Tertiary intrusive rocks, and basement Late Cretaceous, Aspen Formation sedimentary rocks. The release of an updated NI 43-101 compliant resource calculation was announced on Aug. 14, 2018 (please see Otis news release dated Aug. 14, 2018) and the technical report is to be filed on sedar within 45 days. VANCOUVER, British Columbia, April 15, 2019 (GLOBE NEWSWIRE) -- Otis Gold Corp. (“Otis” or the “Company”) (TSX-V: OOO) (OTC: OGLDF) is pleased to announce that metallurgical work conducted at Kilgore on the lower volcanic stratigraphy, referred to as the “Sill Domain”, has returned favourable simulated heap leach gold recovery results of 83.5% on 38mm (1.5”) crush material. Additionally, final gold grades from column leach tests on crushed core show a 59% increase in gold grade. The results continue to demonstrate very favourable metallurgy at Kilgore, and the increase in recovered gold grade confirm that gold grades in the existing resource are potentially under-reported. Final gold test grades from Sill Domain material show a 59% increase, with calculated final grades returning up to 1.42 g/t Au from initial head assay test grades of 0.89 g/t Au. VANCOUVER, British Columbia, Feb. 06, 2019 (GLOBE NEWSWIRE) -- Otis Gold Corp. (“Otis” or the “Company”) (TSX-V: OOO) (OTC: OGLDF) is pleased to announce the results of its annual general meeting of shareholders held on February 5, 2019. At the Meeting, all resolutions proposed in the Company’s Information Circular dated December 31, 2018 were accepted by Company shareholders, including the election of Messrs. Craig Lindsay, Roger Norwich, Don Poirier, Donald Ranta, Tim Miller and Sean Mitchell as directors. At the meeting, the shareholders also approved the re-appointment of D+H Group LLP as the Company’s auditor and the renewal of the Company’s 10% rolling stock option plan. VANCOUVER, British Columbia, Jan. 16, 2019 (GLOBE NEWSWIRE) -- Otis Gold Corp. (“Otis” or the “Company”) (TSX-V: OOO) is pleased to provide the following corporate update. This past year was eventful, and included a number of significant achievements at both our Kilgore and Oakley projects as well as at the corporate level. These milestones have laid the foundation for what we expect to be an active and successful year for the Company in 2019. In November and December, Otis successfully completed the sale of 2.75 million common shares of Revival Gold Inc. (or “RVG”) in a series of private transactions. The sale generated approximately $1.8 million in non-dilutive financing to fund ongoing exploration and overhead expenses. Otis retains a 1% NSR on certain claims owned by RVG at what is known as the Arnett Creek Project. Metallurgical testing of near-surface, mineralized Tertiary volcanic rock and mineralized Cretaceous sedimentary rock is ongoing to assess the potential for “run of mine” processing at the Kilgore Deposit. The studies are being conducted by RDI Minerals and supervised by Global Resource Engineering, both in Denver, Colorado. VANCOUVER, British Columbia, Dec. 12, 2018 (GLOBE NEWSWIRE) -- Otis Gold Corp. (“Otis” or the “Company”) (TSX-V: OOO) (OTC: OGLDF) is pleased to announce that it has raised a total of $502,500 through the sale of its remaining 750,000 common shares of Revival Gold Inc. (“Revival”). Following the sale, Otis retains exposure to Revival through a 1.0% net smelter royalty on 16 federal lode mining claims totaling approximately 331 acres of what is known as the Arnett Creek Project, Lemhi County, Idaho. The royalty is subject to a US$2 million buyback option in favour of Revival. The sale of these shares provides non-dilutive capital to fund the ongoing development of the Kilgore and Oakley Projects and for general working capital purposes. 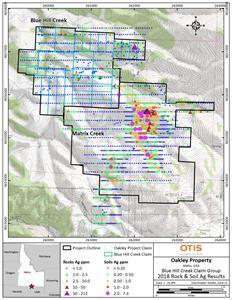 The shares in Revival were received in June 2017 as partial compensation for the sale of two non-core claim blocks known as the Hai and Gold Bug Projects (see Otis News Release dated June 30, 2017), and the area is currently subject to an ongoing drilling program by Revival (see Revival News Release dated Dec. 4, 2018). 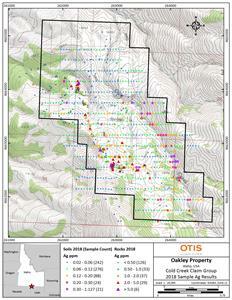 VANCOUVER, British Columbia, Dec. 04, 2018 (GLOBE NEWSWIRE) -- Otis Gold Corp. (“Otis” or the “Company”) (TSX-V: OOO) is pleased to announce additional results from its recently completed 2018 exploration program at the Oakley Project (or “Oakley”), Cassia County, Idaho. Surface geochemical studies consisting of rock outcrop mapping, rock-chip sampling, and soil surveys, have identified several areas of mineralized outcrop and soils with significant gold and silver results at both the Blue Hill Creek and Emery Creek targets. Assay results from rock chip samples include gold values up to 1.75 g/t gold (or “Au”) and silver values up to 105.0 g/t silver (or “Ag”). 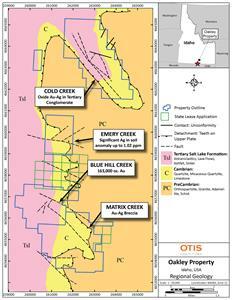 Blue Hill Creek contains an existing Inferred Resource of 163,000 ounces gold in 9.97 million tonnes at a grade of 0.51 g/t Au (see Otis Technical Report dated August 8, 2016); Emery Creek is an early stage exploration target. • 2017 soil sample results from Matrix Creek identified a 2-km-long gold- and silver-in-soil anomaly defining a detachment structure and associated mineralized. • Black Matrix Breccia body with gold values up to 0.988 g/t Au and silver values up to 5.4 g/t Ag. VANCOUVER, British Columbia, Nov. 19, 2018 (GLOBE NEWSWIRE) -- Otis Gold Corp. (“Otis” or the “Company”) (TSX-V: OOO) advises that a complaint has been filed against the United States Forest Service (“USFS”) by two environmental groups in connection with Otis’ recently approved Kilgore Project Plan of Operation (see News Release dated August 23, 2018). Otis will communicate any developments in connection with this matter as they become available. In the interim, Otis will continue ongoing development activities at Kilgore under the current approved Decision Notice issued by the USFS. The complaint was lodged in the U.S. District Court for the District of Idaho. Otis is a resource company focused on the acquisition, exploration, and development of precious metal deposits in Idaho, USA. 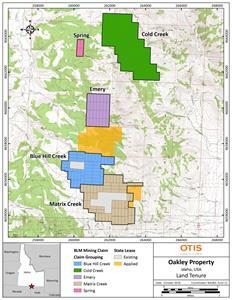 Otis is currently developing the Kilgore Project, located in Clark County, Idaho and the Oakley Project, located in Cassia County, Idaho. VANCOUVER, British Columbia, Nov. 13, 2018 (GLOBE NEWSWIRE) -- Otis Gold Corp. (“Otis” or the “Company”) (TSX-V: OOO) (OTC: OGLDF) is pleased to announce the results from its recently completed 2018 exploration program at Cold Creek, a target located at the north end of the Oakley Project, Cassia County, Idaho. Surface geochemical studies consisting of rock outcrop mapping and sampling, and a 200 metre (“m”) by 50m soil sample grid, has revealed a 3.5 km long by 0.5 km wide trend of anomalous gold and silver values (Figures 1 & 2 – Au & Ag rock and soil sample result maps). Assay results from rock chip samples include gold values up to 1.9 g/t gold (or “Au”) and silver values up to 8.4 g/t silver (or “Ag”). After analyzing these results, Otis expanded its Cold Creek claim package by locating 32 new federal lode mining claims (totaling 640 acres) (Figure 3 - Land Tenure map). Geochemical and structural data collected from the 2018 field season, along with historic reverse-circulation drilling data, is being modelled in 3D in order to develop drill targets for future testing. A total of 651 soil samples were analyzed for gold and silver. Results show an anomalous zone or ‘core’ to the Cold Creek target within the Tertiary Salt Lake formation tuffs and conglomerates that indicates the potential for sub-surface Au-Ag mineralization. 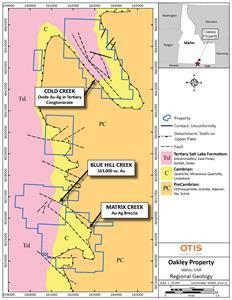 The anomalous zone is defined by gold values up to 0.14 g/t Au and silver at 1.13 g/t Ag. Soil results also show a strong anomaly along the fault-controlled Cold Creek drainage to the East. This fault may host mineralization and indicates potential expansion of the anomaly to the East. 231 rock-chip samples were collected across the project area and contained up to 1.9 g/t Au and up to 8.4 g/t Ag within the altered and oxidized ash and tuffaceous matrix of the Tertiary Salt Lake Formation conglomerate (Tcg). 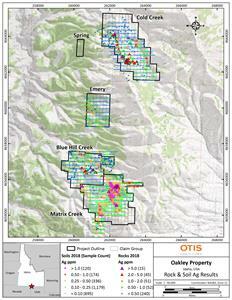 Results have confirmed that the Tcg is the principal host for mineralization within the Cold Creek claims. 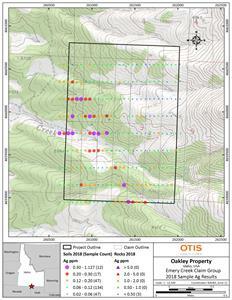 As a result of insights gained during the 2018 field season, Otis has expanded its land package at Cold Creek by 32 claims (640 acres). 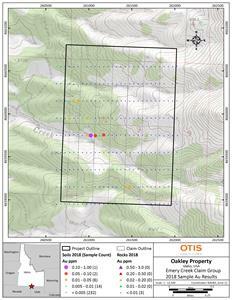 In 2019, Otis plans to continue exploration at Cold Creek which will include permitting of a reverse-circulation and core drilling program as well as continued geologic mapping and geochemical sampling programs. Additionally, a LiDAR survey planned for 2018 and designed to assist in identifying fault structures will now be completed in 2019. 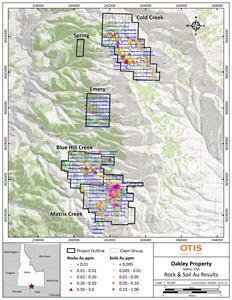 The Oakley Project (“Oakley”) is a gold-silver exploration prospect located 21 km south of Oakley, Idaho, and 3 km north of the Idaho-Utah state line, and along trend from the Vipont Mine in Utah 11kms to the south. The property lies along the western flank of the Albion Mountains, part of the Albion-Raft River-Grouse Creek Metamorphic Core ­Complex. Oakley contains multiple targets located along a trend greater than 10 km in length and comprises the Cold Creek target to the north, and the Emery Creek, Blue Hill Creek and Matrix Creek targets located to the south of the project (Figure 4 - Regional Geology map). VANCOUVER, British Columbia, Nov. 08, 2018 (GLOBE NEWSWIRE) -- Otis Gold Corp. (“Otis” or the “Company”) (TSX-V: OOO) (OTC: OGLDF) is pleased to announce that it has raised a total of approximately $1,320,000 through the sale of 2,000,000 common shares of Revival Gold Inc. (“Revival”). A total of 1,771,000 shares were sold in a private transaction and the remainder were sold through the TSX-Venture Exchange. The sale of these shares provides non-dilutive capital to fund the ongoing development of both the Kilgore and Oakley Projects and for general working capital purposes. The Company’s remaining shareholding in Revival, totaling approximately 750,000 shares, will be held for investment purposes. The shares in Revival were received in June 2017 as partial compensation for the sale of two non-core claim blocks known as the Hai and Gold Bug Projects (see Otis News Release dated June 30, 2017).